The opinions expressed in this article are the author's own and do not necessarily reflect the views of Her Campus. Alexandria Ocasio-Cortez has spoken, and it’s official: moderatism in politics is not cool. The representative called out the moderate stance in a speech this month, labeling it lazy, nay, “meh,” in what will likely be made into a heralded meme in no time. The answer was in front of us all along, ladies and gentlemen; our predisposition towards logic and mediation was the real obstacle standing in the way of world peace, and unchecked extremism, or in the words of Ocasio-Cortez, ambition, is the way to go. It’s a shame that no one has ever thought of Ocasio-Cortez’s brilliant attitude before — oh, wait — Hitler did. Stalin did. Mussolini did. There are a number of men with quite a body count to their name in history who thought uninhibited extremism was the simple answer to a better society, and as the true visionaries, if they just managed to convince everyone else to rip off the brakes, launch full steam ahead with their eyes closed, and do whatever it takes, utopia would inevitably be reached. You know, the road to hell -- and the Holocaust, apparently -- is paved with good intentions. I hold the firm position that being a moderate is boring. And if it wasn’t already evident, there’s no reward to it. You get flack from both parties as the awkward one in the middle. You’ve sacrificed that primeval feeling of belonging to a group -- there’s no mass of people behind you to automatically back your viewpoints, because your views are not part of the left or right’s complete party package. As a member of The Middle, you’ve failed to suspend your thought process on the wings that are “ideology.” With pure ideology comes easy solutions (just follow the yellow brick road of whatever overarching thing you believe in) and the intoxicating sensation that you belong to some immortal belief that feels bigger than you, and moral justification. As a moderate, certain benefits are not included. Any claim to fame is most likely out the window for a political moderate. Forget about having a fashionable political brand -- and don’t expect team colors any time soon. However, there’s a quiet pride in doing your best to remain logical and consider both sides, a pinnacle of classical thought. The solutions reached through such consideration are carefully thought out, and they rest on sturdy foundations built from the ideas of both major parties. In comparison, extremism is dangerous and unproductive. Extremism assumes an action is right based on abstract morality, rather than checking the consequences that actually result in reality to determine whether an action is truly viable. It ignores opposing voices which, in any other circumstance, could be used as constructive criticism that builds a more airtight solution, because in this case, the other voice is morally wrong. If the target is within the lines of the righteous ideology, then the aim can be sloppy. The proof: Ocasio-Cortez’s “Green New Deal,” designed to combat pollution by (among other things) limiting the number of cows on the planet. The young representative might be able to rock a red lip at Congressional meetings, but genius she is not. 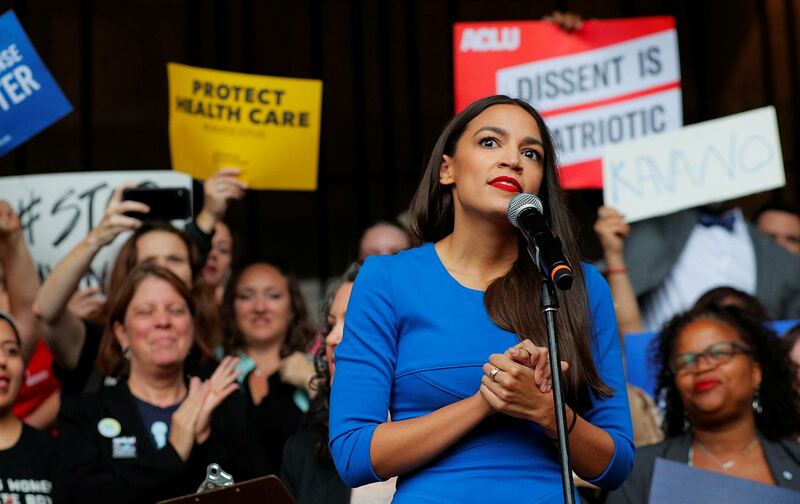 Ocasio-Cortez can mock moderate political thinkers for treading carefully — but we tread carefully because we take the future of our country, and its views, seriously. If that means building better solutions, and a more stable future, then I can take the peer pressure.